Profit Bandit is a mobile scouting app. Scan any barcode and determine if an item is profitable for resale on Amazon. Find the lowest price for each condition and fulfillment channel, learn if an offer is restricted or selling slowly and get historical pricing and rank data from Keepa and CamelCamelCamel. Can be used at trade shows, big-box retail stores, thrift shops etc. SellerEngine offers help, support and advice on how to use the application and how to make money selling on Amazon. Have you used Profit Bandit? Write a review here (you don't have to register first). See all 12 news items about Profit Bandit. Want to talk about Profit Bandit? Start a new discussion (you don't have to register first). 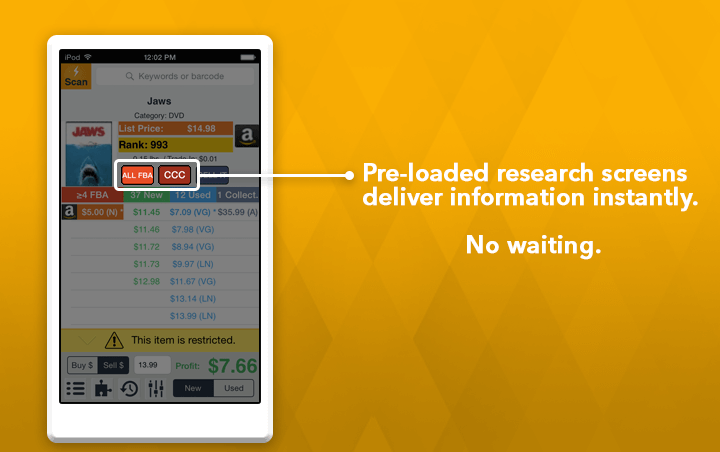 Mobile product research tool Profit Bandit now supports Amazon Australia. Profit Bandit is a product research mobile app for Amazon sellers, available to download for Android and iOS devices (Amazon Australia is available now for Android, and is coming soon to the iOS version). By scanning product barcodes, Profit Bandit provides accurate information about Amazon listings in real time. The data includes sales rank, sellers, Buy Box ownership, prices and estimated profit. Historical sales and price data is provided via Keepa and CamelCamelCamel. It can be used by Amazon sellers of any level and is a must-have for anyone who does retail arbitrage. Profit Bandit also provides information on selling restrictions to help prevent sellers from buying items that they will not be allowed to sell. It comes with a free trial for a limited number of ASINs, and then provides unlimited scanning for US $9.99 or AU $14.01 per month. No payment information is required to take the trial. For a limited time, new Amazon Australia users of Profit Bandit can get an extended 2 month unlimited trial. SellerEngine is also a member of the Marketplace Developer Council, a group of experienced solution providers who share valuable insights and feedback on existing and prospective tools and programs to shape the roadmap and priorities for Marketplace Web Service APIs and associated tools. Sellery is an Amazon real-time repricing tool. It allows hundreds of unique price combinations, to adapt to market conditions and personalize pricing strategies. 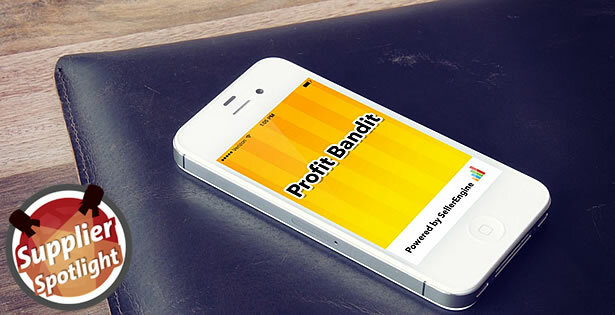 Profit Bandit is a mobile research tool for businesses that sell on Amazon. Profit Bandit can scan any barcode and determine if an item is profitable for resale on Amazon. SellerEngine Plus helps sellers grow their Amazon business. Features include easy product entry, FBA shipment and listings management, automatic repricing, inventory dashboard, pick list and mailing label printing and more. The Marketplace Appstore is a new part of Seller Central, available in North America, where businesses that sell on Amazon can discover applications to help them automate, manage and grow their businesses. Mobile research tool for Amazon sellers Profit Bandit is testing an update focused on improvements to its scanning functionality. Profit Bandit will have a new camera-based scanner, based on the most up-to-date technology from Google and Apple, for users who don't have a bluetooth scanner, allowing faster and easier scanning. Tests show that the new scanner opens in less than 1 second and focuses and scans fast. It works by targeting barcodes within a square outline. When a barcode falls inside its borders it lets the scanner quickly focus and scan. In addition, the update of Profit Bandit for Android will no longer require an extra app to connect to a bluetooth scanner. Android users will be able to connect their device much more easily. The company behind Profit Bandit, SellerEngine, will be exhibiting at the Las Vegas PROSPER Show this March 11-14. Mobile product research app Profit Bandit has been profiled on the Web Retailer blog. Austin Fisher from SellerEngine explains why Profit Bandit is the number one mobile app for Amazon product research and scouting, in Spotlight on Profit Bandit from SellerEngine. Profit Bandit provides complete and accurate offer data, historical data, restricted item warnings and other alerts, as well as an easy-to-view profit calculation - all in one application. Mobile research tool for Amazon sellers Profit Bandit has been updated to use the latest Amazon API, and now provides more accurate FBA offers. The new version allows sellers to see the lowest FBA offer for each condition as well as the exact number of FBA offers. Previously sellers could scan products and see zero FBA offers reported, but when checking on Amazon would find several FBA sellers on the listing. The Amazon API used by Profit Bandit and other scouting apps previously gave incomplete offer data, limiting the accuracy. A recent addition to the API provides the total number of FBA offers and the lowest FBA offer for each item condition. The new feature is support by Profit Bandit 8.16 for iOS and 4.15 for Android. Mobile product research app Profit Bandit has been updated with instant viewing of product sales data from CamelCamelCamel and Amazon FBA. When an item is scanned, Profit Bandit preloads the FBA offers page, as well as data from Amazon price-tracking service CamelCamelCamel, so the results can be viewed instantly after the item's summary information has been viewed. The feature can be disabled by users on low-allowance mobile data plans. 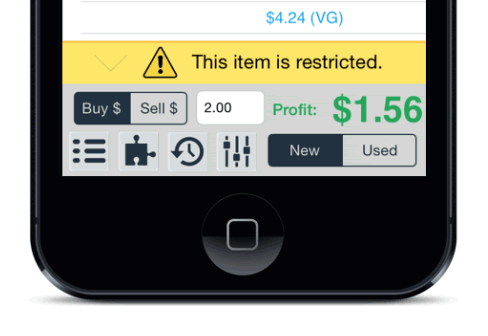 Mobile research tool for Amazon sellers Profit Bandit has introduced notifications to indicate when a scanned item is restricted from sale. The option to use Keepa for product research, instead of CamelCamelCamel. Peloading Amazon offers and CamelCamelCamel listing pages, making the app faster. Updated fees and EU VAT calculations. Easy identification of Amazon's price in the list of offers. Amazon inventory scouting app Profit Bandit has added new filtering for FBA items, and improved its profit calculation algorithm. 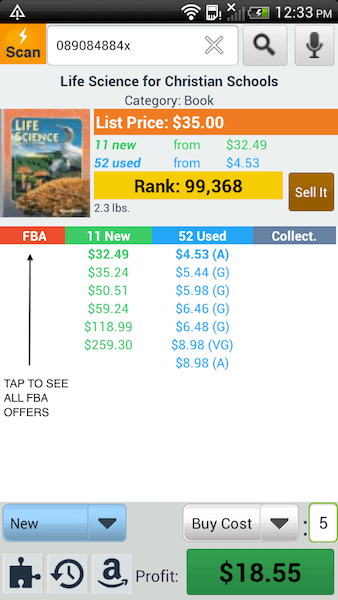 For each scanned item, the app now shows existing FBA offers along with seller names and feedback percentages. SellerEngine has also changed how Profit Bandit calculates estimated profit, better reflecting Amazon's fee structure. Popular inventory "scouting" app Profit Bandit has switched from a one-time fee of $14.99 to a $9.99 monthly subscription. Profit Bandit subscribers will also get access to a new series of webinars, and a discount of 20% off a bluetooth scanner. The new subscription currently only applies to the Android version of Profit Bandit. It will be coming to the iPad and iPhone apps soon. Amazon research app Profit Bandit has new videos, FAQs, and step-by-step help guides. The new videos cover Profit Bandit's Buy List, how to connect a bluetooth scanner and more. The step-by-step help guide is for both Profit Bandit beginners and experienced users, and includes setting up profit calculations and the special searches menu. Do you have news about Profit Bandit? Let us know. You never leave home without your smartphone. Install Profit Bandit on your iPhone or Android and you’ll be bringing your most valuable Amazon sales tool with you, too. Algopix provides real-time product market analysis for eBay and Amazon sellers. Actionable insights are available for 14 global marketplaces and help save time, decrease risk and optimize sales. Data points include product identifiers, recommended market price, an expenses breakdown, competition analysis, demand level, estimated profit and total sales estimates, to help sellers make better decisions about what to buy and where to sell it. Unicorn Smasher is a free Amazon product research tool. This simple to use Chrome extension displays relevant info on Amazon products to simplify and speed up product research. Unicorn Smasher displays data from sales and revenue estimations, average price, number of sellers, average review ratings, plus more. Save it all in a handy dashboard or export to csv. SupplySpy helps Amazon sellers identify profitable products. Users are able to determine brands with popular products on Amazon, competitors who are selling these products, and contact information for product suppliers. The Bulk Analyzer tool analyzes product supplier lists, providing automated calculations that allow the user to identify products that will turn a profit and how much the profit will be. Price Checker 2.0 is Amazon profit calculation software for wholesale supplier lists. It returns all relevant data from Amazon.com and Amazon.co.uk APIs simultaneously, showing possibilities across both marketplaces, and links each item to eBay, Alibaba Wholesale, Google, Keepa & CamelCamelCamel for quick product analysis. Price Checker 2.0 can analyze up to 17,000 products per hour.